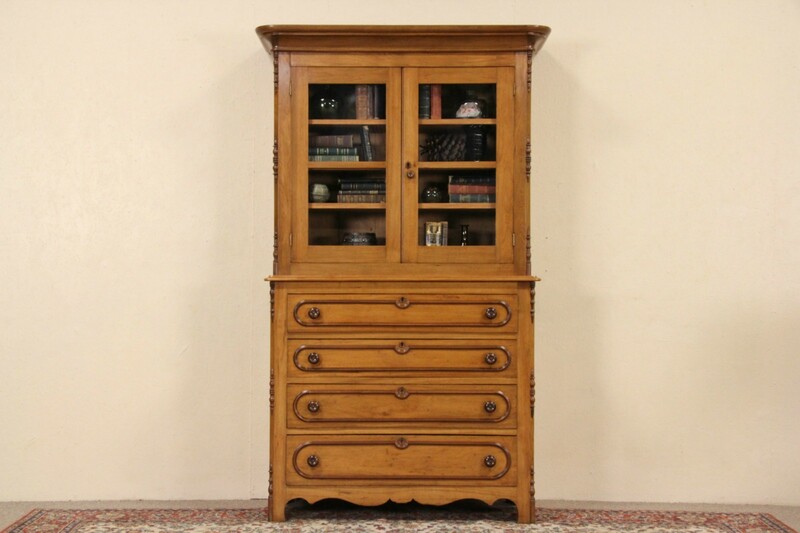 Expertly hand crafted by a country carpenter of solid butternut in the 1850's during the Victorian period, this bookcase, linen press or china cabinet has wonderful warm patina. The finish is in excellent condition. Corner and "racetrack" moldings, knobs and the crown are walnut on this American made antique. The upper section is a separate piece for easier moving, doors have old wavy glass. Drawers have authentic hand cut dovetail joints and chamfered bottoms. Square cut nails are visible. Dimensions are 52" wide at the crown, 21" deep, 7' 1/2" tall and the base cabinet is 42" high.